This hearty salad combines beef, pasta, artichoke hearts, bell pepper, and olives for a complete meal. Place beef steak on rack in broiler pan so surface of beef is 3 to 4 inches from heat. Broil 16 to 21 minutes for medium rare to medium doneness, turning once. Remove; let stand 10 minutes. Cut steak lengthwise in half, then crosswise into thin slices. 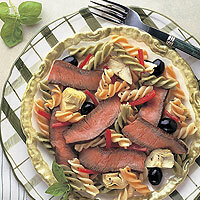 Combine beef, pasta, artichoke hearts, bell pepper, olives and basil in large bowl. Add vinaigrette; toss. Cover and refrigerate at least 2 hours.